Robertson thought he was going to look at cars to purchase at Suburban Ford of Sterling Heights, Mich., with Evan Leedy and Blake Pollock, who both helped coordinate the gift, worth an estimated $37,000. 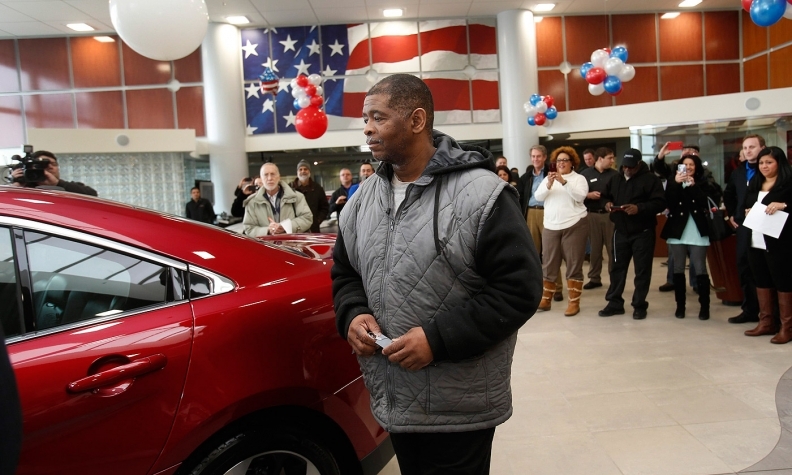 DETROIT (Reuters) -- A Detroit factory worker who has walked more than 20 miles during his daily commute to work for a decade was surprised on Friday with a brand new car, donated by a suburban car dealership. The unexpected gift is the latest in an outpouring of donations from supporters across the globe who, touched by James Robertson's plight, have raised more than $310,000 to help him buy a car. Robertson has told the Detroit Free Press that his car broke down a decade ago and, making $10.55 an hour, he has been unable to save for a new one. "I don't like it, I love it," said Robertson, 56, who appeared baffled as he sat behind the wheel of his 2015 red Ford Taurus. "If only my parents could see me now." Robertson thought he was going to look at cars to purchase at Suburban Ford of Sterling Heights with Evan Leedy and Blake Pollock, who both helped coordinate the gift, worth an estimated $37,000. Instead Robertson was greeted by reporters and a team of supporters who first learned of his marathon commute this week in a story that ran in the Sunday Detroit Free Press. The story has since been widely shared on social media, and Robertson has been featured on national network news programs. The publicity has prompted a renewed discussion about reforming Metro Detroit's troubled public transportation system. Leedy, 19, a student at Wayne State University, launched an online GoFundMe.com fundraiser after he read about Robertson's daily trek between his home in Detroit and the Schain Mold & Engineering factory in the suburb of Rochester Hills. He spent part of the week negotiating a reasonable insurance rate for Robertson, who has not driven in 10 years. Leedy told Reuters he was initially quoted a $15,000-a-year premium, a quote that illustrates Detroit's notoriously high insurance rates. The Free Press was tipped off by Pollock, a banker who had befriended Robertson two years ago when he spotted the factory worker walking by his office on his way to work. The newspaper said Robertson takes buses to work, but has to walk more than 20 miles round trip because buses do not cover the whole route. He starts his commute at 8 a.m. for his 2-10 p.m. shift, and does not get home until 4 a.m. He has perfect attendance at his job, the Free Press said. 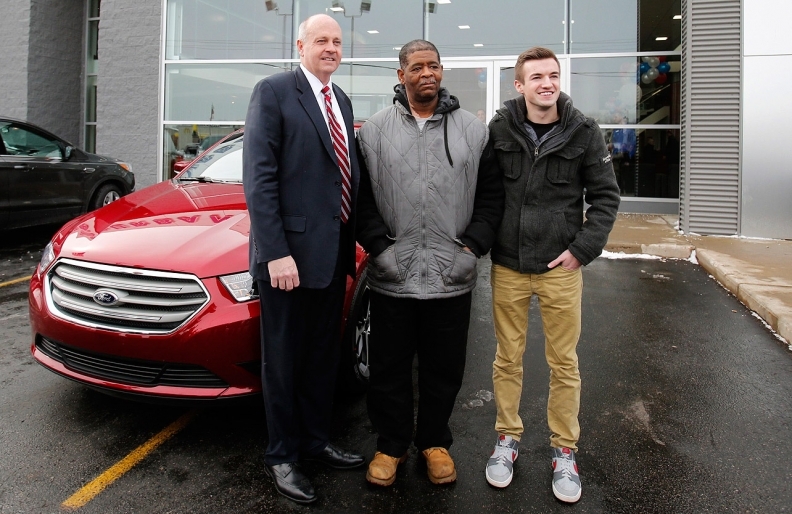 Detroit resident James Robertson, center, poses with banker Blake Pollock, left, and Wayne State University student Evan Leedy, right, after Robertson was surprised with a 2015 red Ford Taurus sedan as a free gift at Suburban Ford of Sterling Heights, Mich., on Friday. The 56-year-old factory worker, known for walking 21 miles to get to and from work for 9 years, is also the recipient of about $300,000 in donations raised by Leedy after Pollock shared his story with local media.